We have some great news for you today on #SundayFunday. 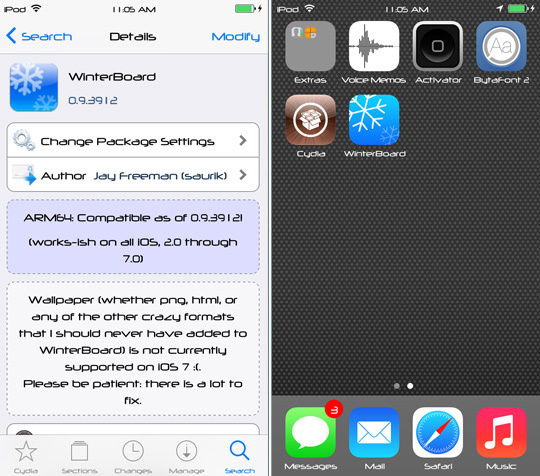 Jay Freeman, better known by his alias Saurik on Twitter, has recently tweeted that WinterBoard has been updated to support iOS 7 and the iPhone 5s’ 64-bit processor. WinterBoard 0.9.3912 (just released) runs on iOS 7 and seems compatible with ARM64; theme artists are encouraged to report any crashes/bugs. Wallpaper (whether png, html, or any of the other crazy formats that I should never have added to WinterBoard) is not currently supported on iOS 7. Please be patient: there is a lot to fix. Along with all of the compatibility fixes this new version of WinterBoard brings about there is a new icon for WinterBoard that looks great on iOS 7, which makes us wonder why Cydia’s icon has yet to be officially updated. Although WinterBoard has now been updated, you will still have to wait for themes to be officially updated and re-compiled for iOS 7 and ARM64 devices before they will be fully compatible. Try out the theme,CIRCULUS, it is cool and has a great effect to the icons. What font is that in the screenshot of the iPhone?